I want this game to be easy to access. It needs to have fairly intuitive rules and a user interface that looks good, and makes sense in context. I tried to cram everything onto a single page for the character sheet, but the design generally started to look a bit too busy. So I've gone with the option of splitting the methods for tracking a character into two separate entities. 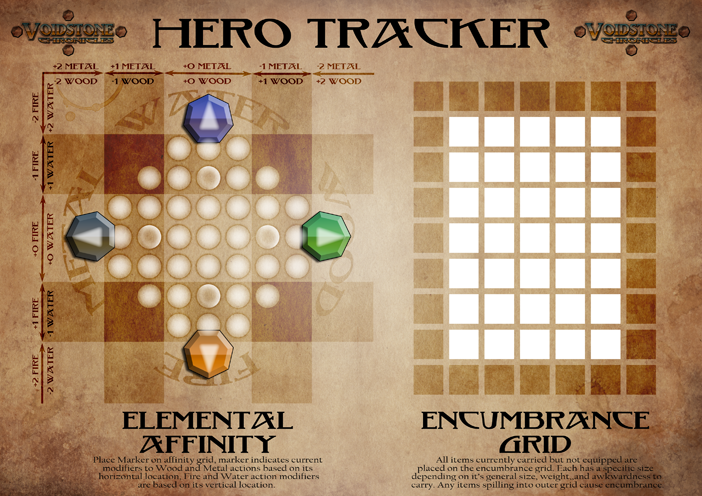 The character tracker probably works best on a A4 (or similar) sized sheet. On the left is the "emotional energy"/"elemental affinity" matrix (very similar to the Shakespearean game board I designed a few years ago for a Game Chef contest...and something that's been appearing in a few games from Vulpinoid Studios lately). A glass bead shouldn't be too big for tracking the energies across this board as the moods and situations of the heroes change throughout the game. The entirety of the great realm is a series of discs orbiting in a vast sky. These discs some in several sizes...some no more than a dozen metres wide,others stretching hundreds of metres across. The larger discs tend to be slower in their orbits, and the smaller discs tend to revolve around these, or perform complex orbits and fast orbits between local clusters. The third and fourth books for Voidstone Chronicles are now written up and ready for public critique. Now we've got the books of Earth, Wood, Fire and Metal (You can find them here.). The Book of Water, which is the GMs guide, is being written up now, along with the first set of culture and calling books. The first four callings are the core occupations for heroes in Voidstone Chronicles, they vaguely follow the traditional split of Fighter, Wizard, Cleric, Rogue...but not quite. Warriors tend to be soldiers or mercenaries depending on where they are from; either way, they hit things hard. Hunters might be bounty hunters or nimble-footed tomb robbers; either way, they're fast. Adepts might be learned scholars who master ancient mysteries through formal training, or intuitive prodigies; either way, they wield mystic arts through internalising their power. Disciples might be wild shamans or ceremonial priests; either way, they wield magic by communing with spirits and gods. Then there will be a pocketmod for each "Culture" that characters can come from, and another for each "Calling" that they might follow. There are no images in the books so far. I've got a few illustrations, but I'm actually planning to use another artist to do most of the pictures for this particular project. In a setting where the world consists of islands drifting in an endless sky. The traditional European/Hermetic 4 way elemental split seems a bit unbalanced...fire and water, I can see the opposition and balance; but earth and air seems heavily dominated by the latter, when earth composes the tiny chunks of floating matter and air consists of almost everything else in existence. 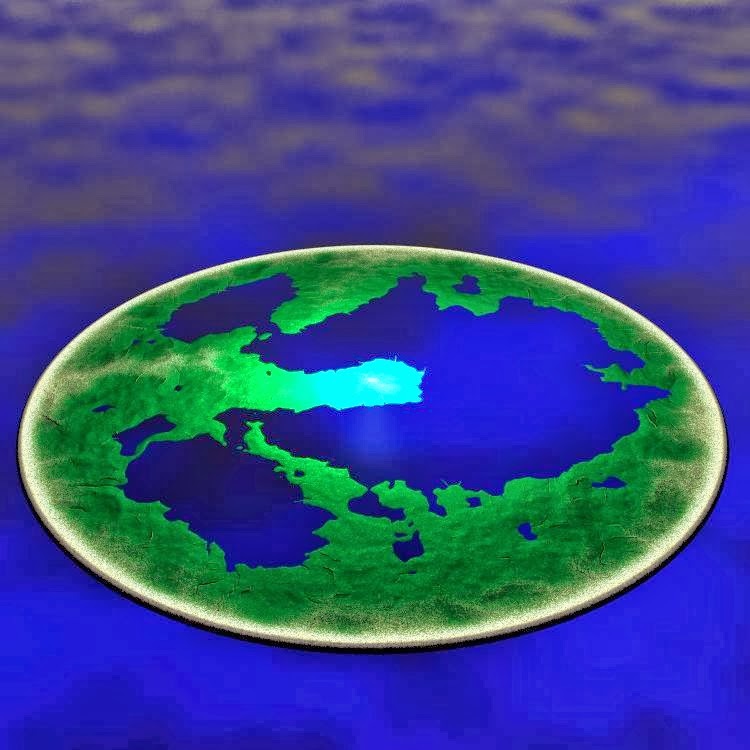 Maybe an eastern elemental split is better...earth, wood, metal, fire, water. We still get the relatively balanced fire and water. We now get wood (the essence of life and vitality) opposing metal (which can embody machines and sometimes unnatural things). 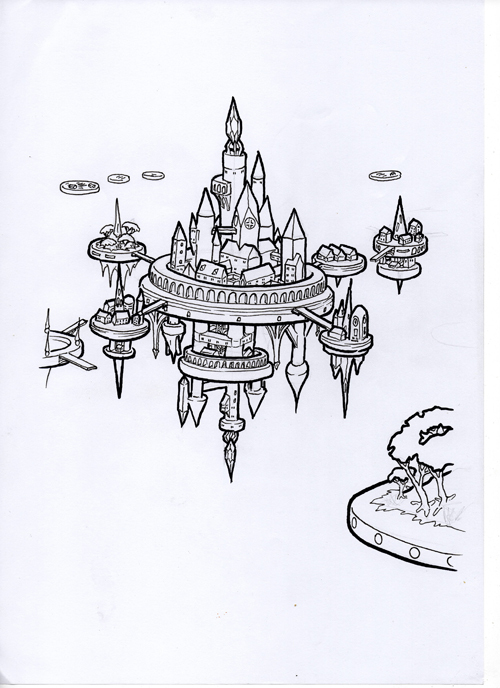 They each centre around earth, like the floating rock platforms on which the people of this setting live. Air is not represented in this cosmology because it is an intrinsic part of everything...specific abilities become focused on those outside elements, while the actual power level of the individual is determined by the central element (the earth). Sorry, there's been a distinct drop in the number of posts this year. I've been pretty frantic over on the Walkabout Explanatory Comic (which is currently up to page 22), and that has meant less time to work on posts here. 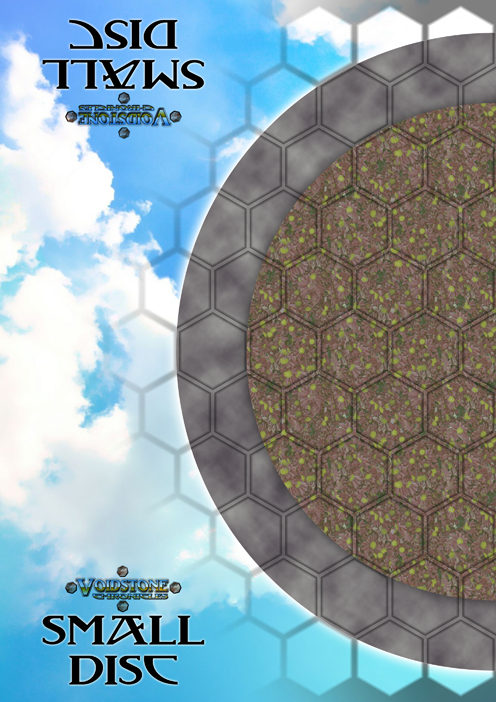 I've got a few map tutorials still needing to be posted. Maybe I'll get around to uploading them soon. 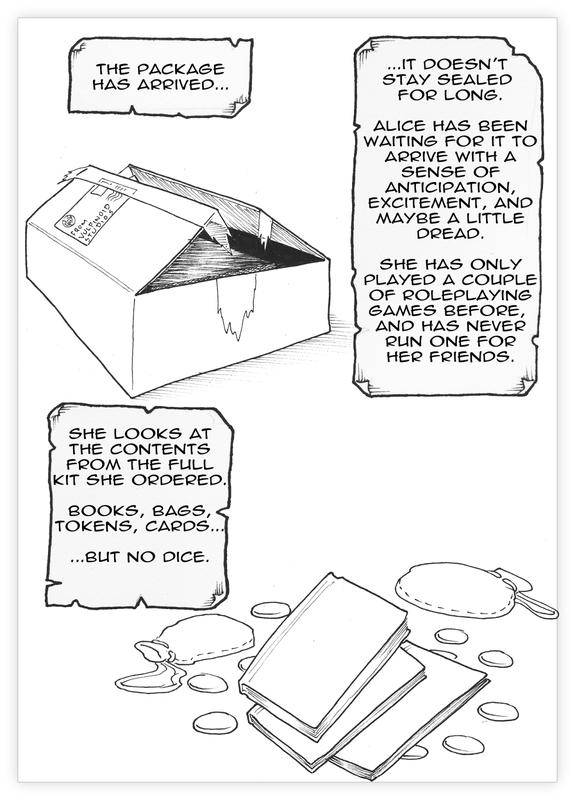 I'm trying a new way to present a roleplaying game. If you've been a regular reader of the blog, you'll already know about this. 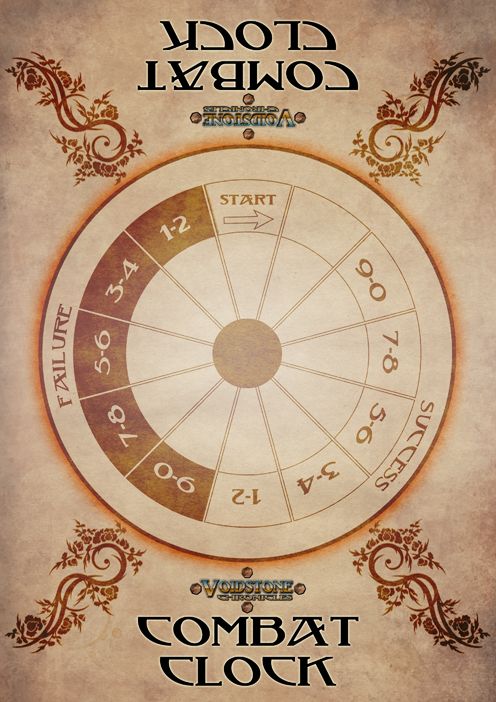 One book will be the basic rules, one book will be an in-game artefact explaining the world from the perspective of the characters and survivors within it, the third book will be an explanatory comic (containing a description of how to set up a game, all the play examples, and clarifications to the basic rules). I've finally put together the majority of the preparatory sketches, and the first pages of the explanatory comic are starting to come together. The ongoing series of pages will be posted at a new blog. 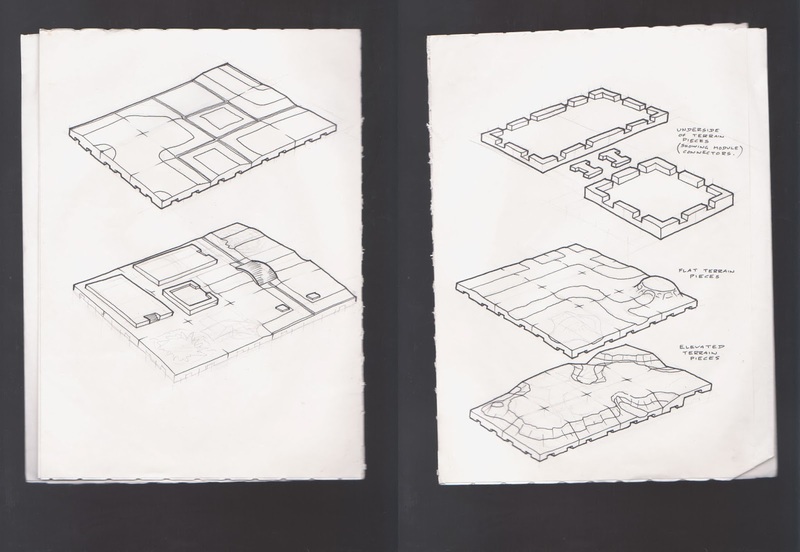 Once, many years ago, I came up with a concept for modular terrain pieces made from moulded resin or plastic. 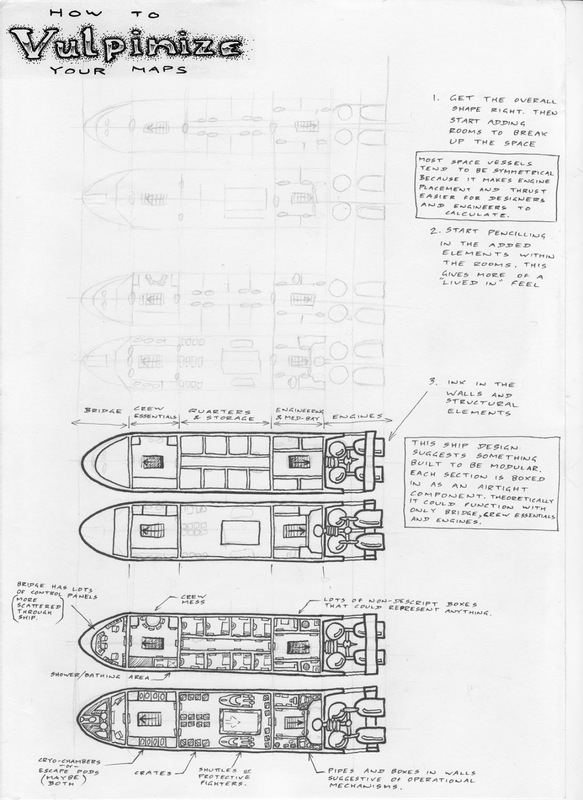 While sorting through some old paperwork, I just found the sketch I drew up for it on some scraps of paper. I never did get much further with this idea. I've had plenty of feedback on my quasi-historical/fantasy mapping tutorials, so it's time to shift gears again. I know there are plenty of sci-fi buffs who've been watching the development of this tutorial series, so here's an opportunity for them to chime in. Sorry about the darkness on this tutorial, I'm breaking in a new scanner (or, more accurately, I pulled down an old scanner from my roof storage...a multi-function centre with obsolete cartridges that are no longer available, but doesn't need anything installed for the scanner function to work). 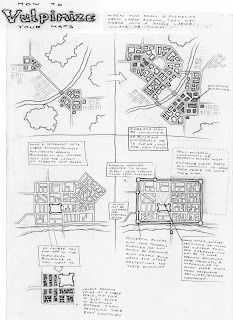 There were a few comments on the last post saying that they were expecting the tutorials to follow the growth of a single settlement from its earliest buildings through to its maturity into a bustling metropolis. That's not the way I decided to go with this particular set of tutorials, but as you can see in this installment, it's certainly something that crossed my mind. There will be another post at a later date, with a video image that gradually shows the growth of a single village through a number of seasonal frames over the course of several decades (4 frames per year...70 odd years...that's 280 frames and it's taking a while for me to compile). 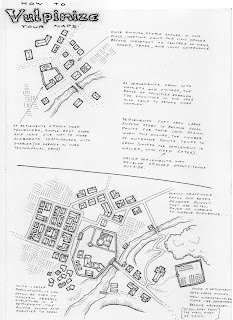 For the moment, just a bit more theory regarding the development of towns and small cities. Once a settlement starts to lure a few more permanent inhabitants, and develops a few buildings it starts to become interesting as a source of adventure in itself rather than just a place for the characters to pass through on their way to more interesting locations. At this stage, settlements exist on a precarious threshold where they will either build critical mass and become towns, or lure bandits/monsters/devious-politician and simply be wiped from the face of the world. Now that we've drawn up the topographic map in Photoshop, we can do some interesting things with it. One of those things is to determine where water levels will be when the terrain is applied to Bryce...you don't need to export it across to Bryce to do that. Flatten the image (or select the whole thing, then do a "copy merged" and paste it into a new layer). Using this, you can go to "Image-> Adjusments -> Threshold". Since we now that light areas are higher than dark areas, we can set the threshold to a certain value...everything below that value will be underwater, everything above that level will be dry. When I draw 3D maps using Bryce and Photoshop, I deliberately don't plan them out too well. I have a vague idea of where I'd like things to go and let the twists and vagaries of fate push my maps in new and interesting directions. For this map, I open up a new image in Photoshop 2048 x 2048 pixels (since that's the Bryce scale for the terrain I'll be using). The first thing I do is draw a black circle on a black background. 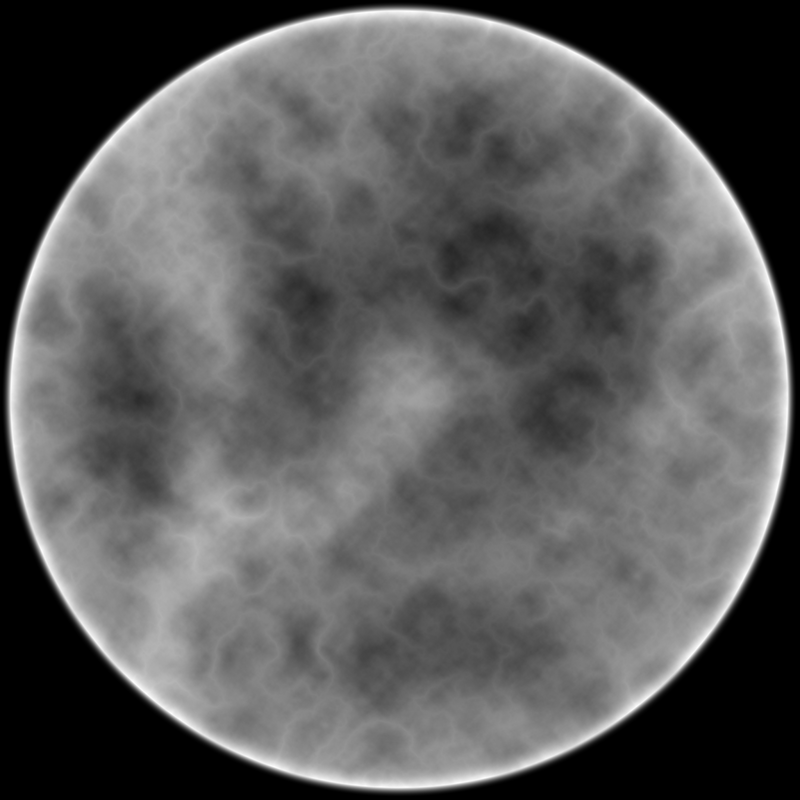 Specifically for this, I've added a thin outer glow (about 20 pixels) around the outside of the circle and a thicker inner glow (about 50 pixels) on the inside of the circle. Both of these glows are done with white. The circle is duplicated and applied as a screened layer directly over itself. 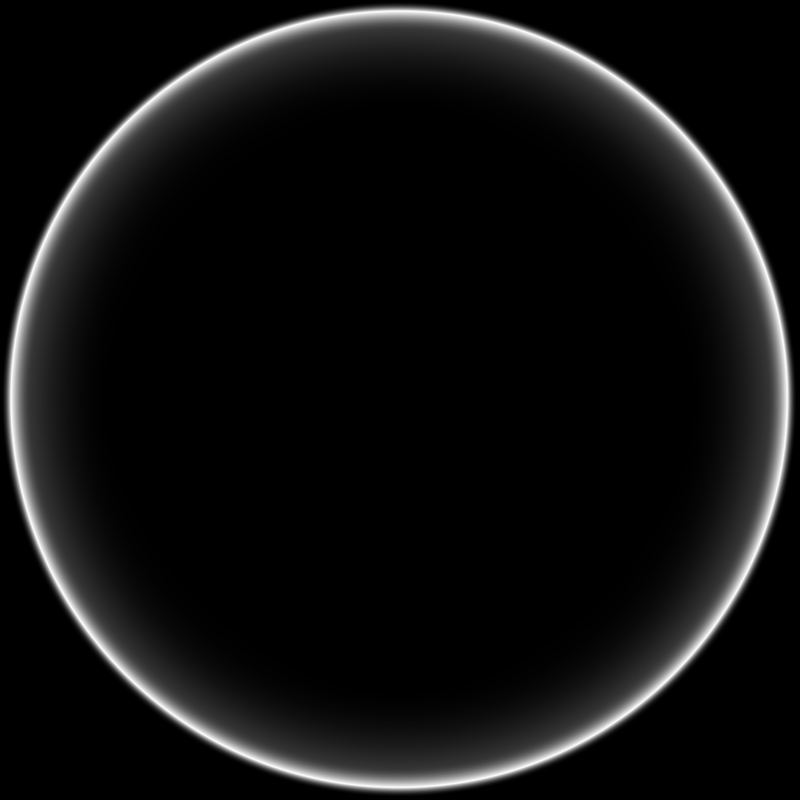 The duplicated version of the circle has its outer glow inner glow expanded to 250. To make this style of map in Bryce, it's pretty simple. Start with File>Document Setup. Make a viewing panel that fits your screen and for the moment, ensure its render resolution is 1:1. There are three sets of manipulation menus at the top of the screen (under the typical drop down menus that you find in almost every program)...they are called "Create", "Edit" and "Sky and Fog". When the "Create" menu is open, it shows a range of standard objects that can be added to a scene. These include (in order from left to right) planes, terrains, trees, rocks, "metaballs", a range of standard solids, flat 2D images and lights, the most recent version of Bryce then includes a tool that lets you export forms more easily to their other software packages. There is a software package called Bryce, it's been through a number of developers over its lifetime. Currently it is released by DAZ (you can find it here). At various stages in its life it has been a free download, as I write this post, that is the case. Go, download it. It's a great 3D tool, and one of the best landscape modelling tools available. Muck around with it, especially the terrain tools, have a look online for some of the other great tutorials for it. It's one of the easiest 3D modelling programs to learn, and while it may not be as powerful as professional tools like Maya....it's free. I love creating maps using a graphic manipulation tool such as Photoshop and Bryce. Here's a little something I've been working on, I'll use a few steps to show you how I did it. The basic premise behind this map is simple. There is a concept called a Dyson sphere. I'm writing this in 2014, before most of the world has reached it. 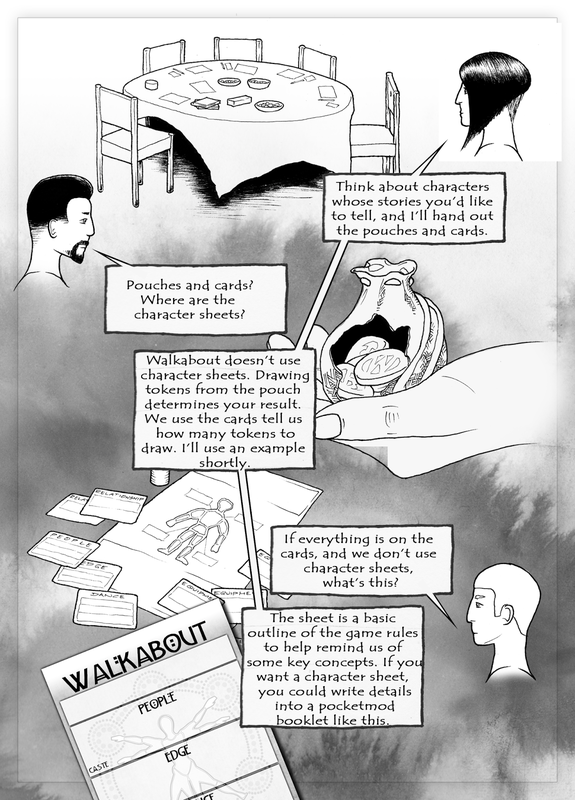 I've decided that this year's regular series of blog posts will be pages from the Walkabout explanatory comic...hopefully 2 or more pages per week (I need to get through 160 pages total). I'll be producing more map making tutorials as well, and still throwing in my usual editorials, rants, and maybe a few game reviews. Anyway, thanks for making 2013 the most successful year for the blog so far. Hopefully 2014 will take it to new heights.